There is nothing better than enjoying the outdoors with family and friends, drinks flowing and grill cooking. 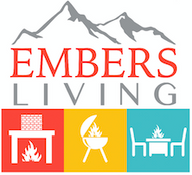 At Embers Living, we have high quality grills and smokers to choose from, both built-in and free standing, along with a variety of accessories to make grilling an easier and more enjoyable experience. Browse our collection of reliable and quality smoker BBQ grill brands, and pick the best one for you to create a better cooking experience with delicious smoked and grilled food that everyone will enjoy!